Paul George’s decision to stay in Oklahoma City with Russell Westbrook is cause for celebration, and even though the Thunder went out of the playoffs in the first round last season, fans are still pushing up ticket prices. The average asking price on the secondary market for a 2018-19 Oklahoma City Thunder ticket is up 2.5% over last season. 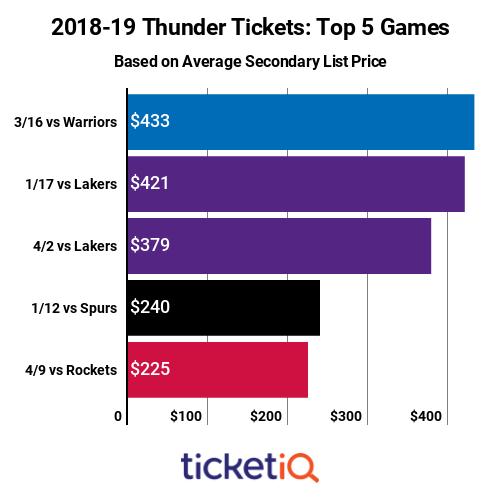 Below is how Thunder ticket prices stack up on the secondary market. 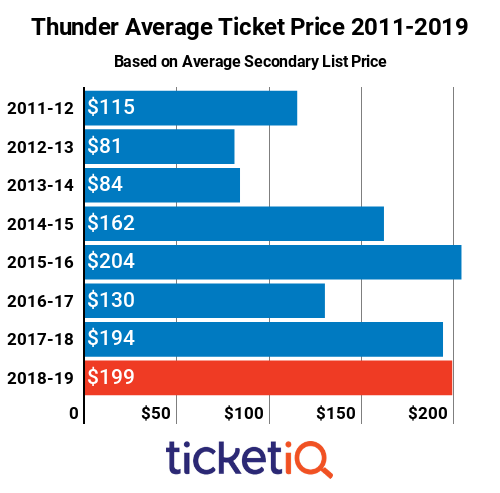 Thunder tickets are the second highest since 2011, when TicketIQ.com began tracking data. Prices reached their peak of $204 in 2015-16, when the Thunder won the Northwest Division and advanced to the Western Conference Finals before losing to Golden State in seven games. At a $199 average asking price, Thunder tickets are ranked No. 9 in terms of price across the NBA, up from a No. 10 ranking last season. with a limit of six seats per game. Most available primary market seats are in the Love's Loud City Balcony and Love's Loud City Mezzanine sections. The team directs fans to its partner Ticketmaster for secondary market tickets, which are available for most games, including the October 21 home opener against Sacramento. Myriad seats in the 300 sections behind the baskets are available for $30 or less for the opener. Elsewhere on the secondary market, TicketIQ.com has similar seats available for $37 and less. As is a bit of theme across the NBA, the three most expensive Thunder games involve the defending NBA Champion Golden State Warriors and the new LeBron Lakers. The priciest game of the season is the March 16 matchup with the Warriors, which is trending at $433. And fans have pushed the price of the January 17 Lakers game up to $421 and the April 2 Lakers game up to $379 for a chance to see LeBron in purple and gold. The next two most expensive games are the real rivalry games – January 12 against San Antonio and April 9 against Houston. 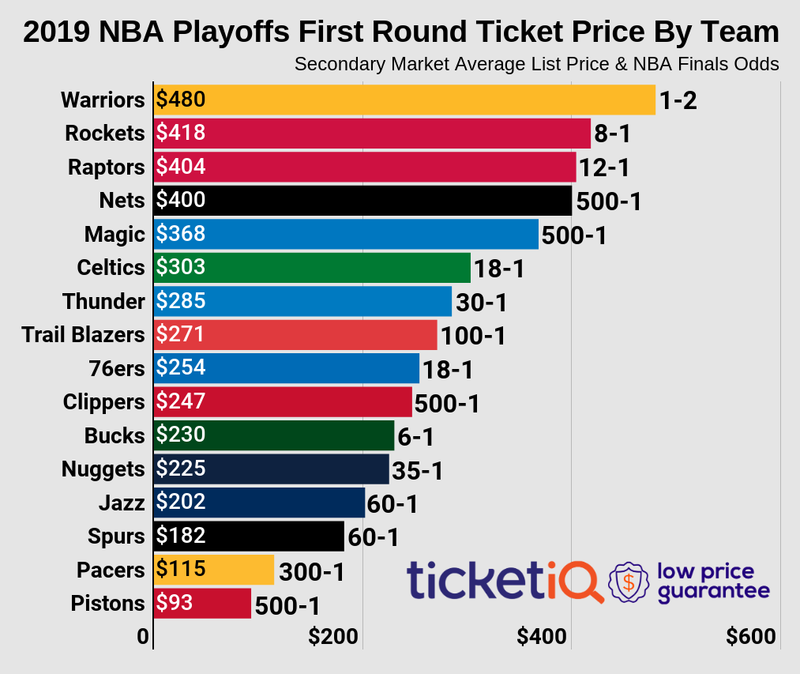 Spurs tickets are have a $240 average asking price, according to TicketIQ.com, while Rockets tickets are going for $225. TicketIQ.com has seats for both games, many with the company's Low Price Guarantee. Given all three teams recent success, it’s likely ticket prices will rise as the games get closer.